After nine years and over 3.26 billion miles, the New Horizons spacecraft made its closest approach to Pluto earlier today. Assuming it survived the encounter, the probe is now drifting away from the dwarf planet as it heads deeper into the Kuiper Belt. UPDATE: NASA switched New Horizons into data gathering mode for the encounter, so it’s going to be dark for a while. The team is not expecting to hear its first ping from the probe until about 8:34 pm ET/5:34 pm PT today (1:34 AM UTC next day). We’ll be posting a second live-stream at 8:30 pm ET/5:30 pm PT so be sure to come back to io9 for that! In addition to the “I’m still alive” ping, NASA is expecting to receive data from the probe later today, including images. Remarkably, it will take New Horizons 16 months to transmit all the data it gathered during the encounter. Also, please keep in mind that the photo above was taken several hours before closest approach. Some outlets are mis-reporting that the picture was taken during closest approach, which is not correct. So as amazing as this picture is, the best is yet to come. In case you missed it, here’s the NASA TV video of the event as it happened at ground control, and the ensuing press conference. New Horizons made its closest approach at 7:49 am ET/4:49 am PT. The timing of the encounter was set years ago after the Jupiter encounter. First call home is expected at 8:53 pm ET/5:53 pm PT. New Horizons mission controllers said the odds of the probe smashing into debris was about 1 in 10,000; fingers are crossed that this didn’t happen. We’ll obviously find out later tonight. Some astronomers speculate that there is atmosphere-sharing between Pluto and Charon owing to their relative mass and proximity. Space scientists would also like to know if the dark pole on Charon has anything compositionally similar to Pluto. 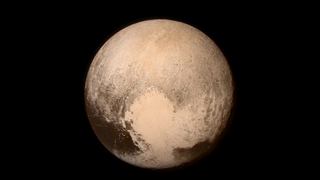 During the flyby, the probe will be taking close-ups of that light heart-shaped region spotted late last week. New Horizons has no deployable parts. The probe is designed like a thermos to be at constant room temperature. Correction: the Long-Range Reconnaissance Imager (LORRI) CCD is designed to operate below –70° C and has to be isolated from the rest of the spacecraft both thermally and conductively. And after ditching six protective caps (five after launch, one after Jupiter), it’s just about pointing the whole damn craft instead of pulling things in and out. It’s also the first space probe with a student-designed instrument — a dust collector. This device has been running since its departure, giving us a system-wide distribution, but NASA had to muzzle its sensitivity during the probe’s turning/manoeuvring stage so that it didn’t get overwhelmed with the noise (as in noisy data, not literal acoustic noise) of the probe’s engines; NASA plans on turning it back on as soon as possible. After today’s flyby, the mission will be far from over. A second target will be finalized from the tiny pool of candidates in August, then manoeuvring thrusters in November, but the mission extension still needs to be approved in 2016. Kind of a no-brainer in my opinion. Contact the author at george@io9.com and @dvorsky. Top image by NASA, Johns Hopkins Univ./APL, Southwest Research Inst.